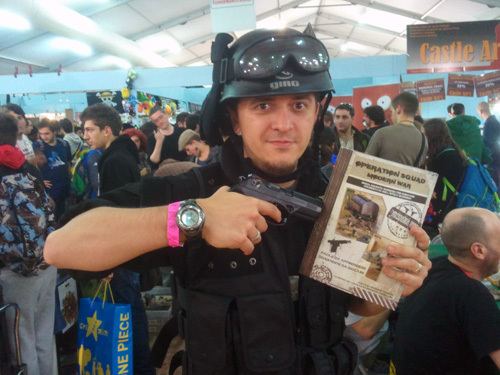 I reported only something of what happened in the days of Lucca C&G. Too much things to do and to see. And now more than two months are distant from this event. 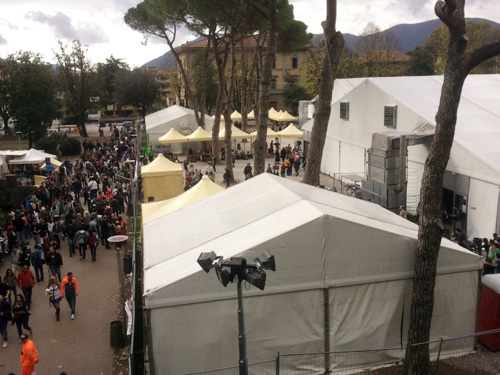 However I hope I showed you what this huge fair means. So you could be here for the 2014 edition. Now it is time to concentrate on our specific area of interests: wargame. We were inside the Games pavilion, in an area called Miniature Island. 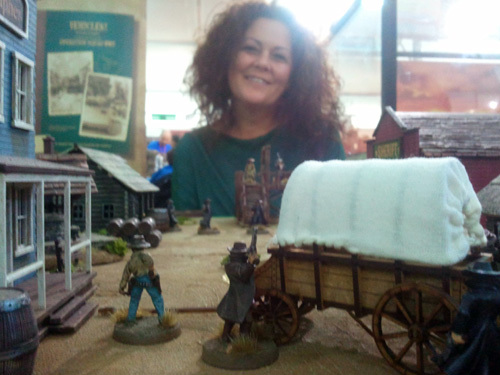 Around us there were some miniature related stands, than demonstration tables (where I was), and in the inside the painters area. 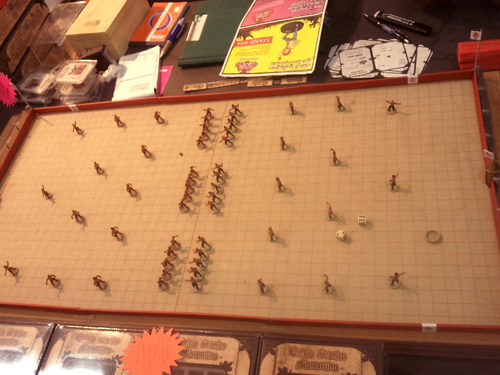 This a horse & musket wargame by our room mate in the hotel. I give him a couple of precious earplugs to survive to Andrea snoring. 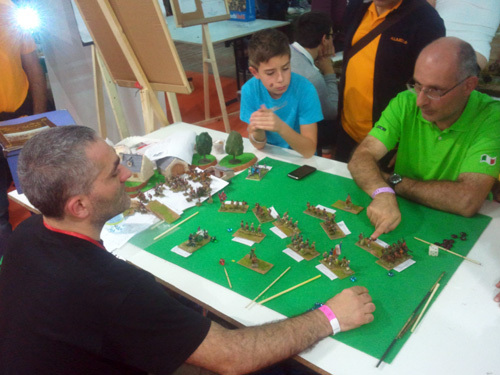 A simple Napoleonic game by Narciso, now in the Clan Conan, veterans of demonstration games in Lucca. Their huge playable scenario: Iwo Jima! Inside the Suribachi some tunnels are dug. 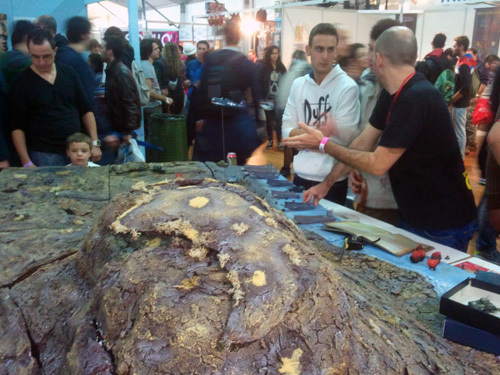 To simulate the terrain they used huge amounts of coffee grounds! 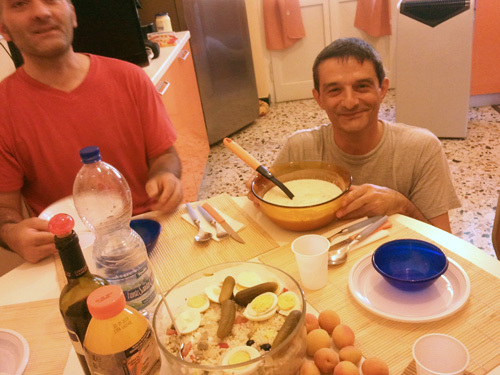 And all was assembled in the small living room of Narciso. That smelled of coffee, indeed. 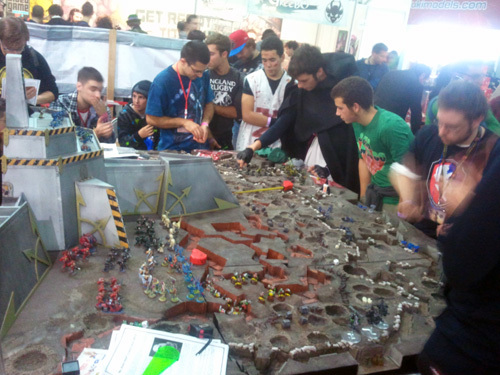 Unofficial Games Workshop Warhammer 40000 demonstration battle. A nice group of alcoholic chaps ran these trenches and 4 days of fighting. The magnificent trio: Sartori, Torriani, Sfiligoi. Presently they are the pillars of Italy regarding wargame rules. Their work is recognised outside our national and linguistic borders. The action in the streets of Iraq. A complete view of the set. 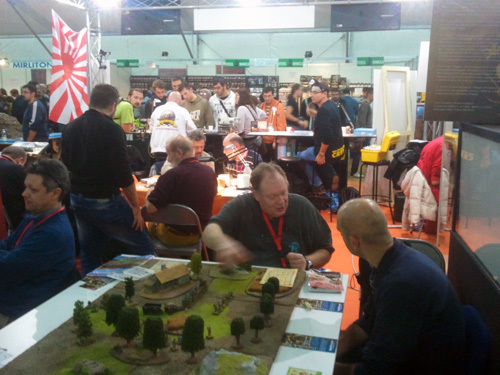 The new wargame by Torriani’s team is setted in Western period. The painters area. 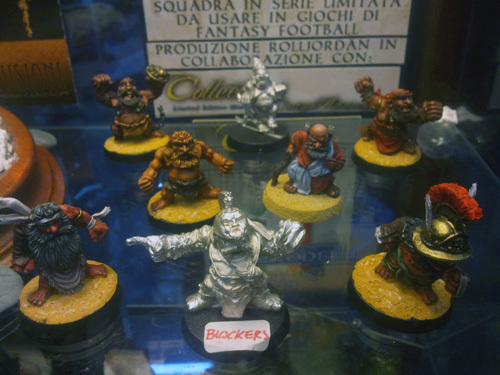 He is Nano Nefasto (ill-omened dwarf), a professional painter from Brescia. On the left the Ludica team. 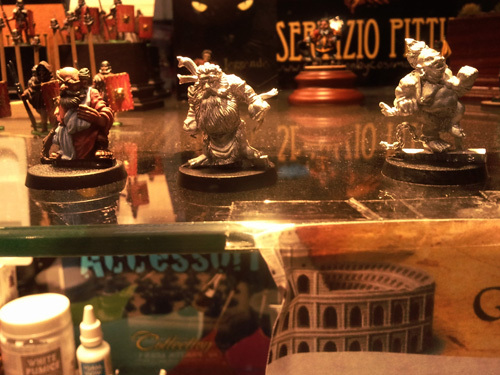 Luciano at work, illustrating how to paint miniatures. 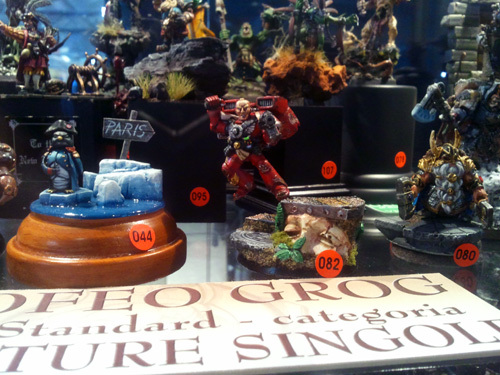 Some of the pieces in the painting contest called Trofeo Grog. Private collection by one of the painters. 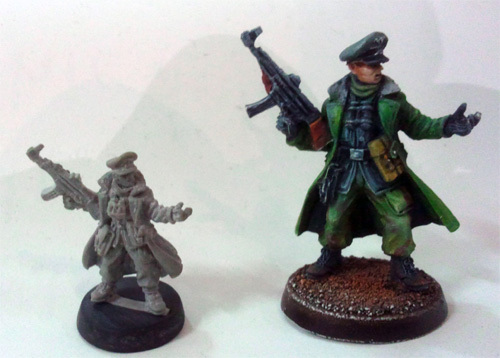 Always miniature sculpted by Auricchio: a 15mm Hastings range. Yes, 15mm, not 28mm!!! 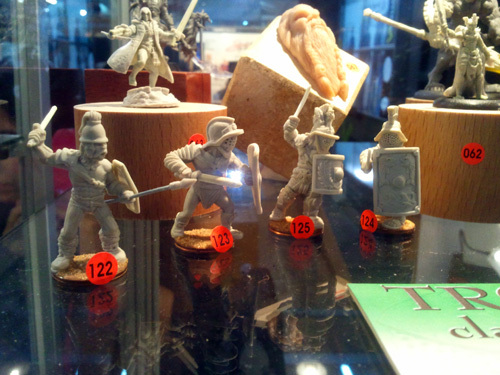 Sculpting contest, always for Trofeo Grog: some gladiators. 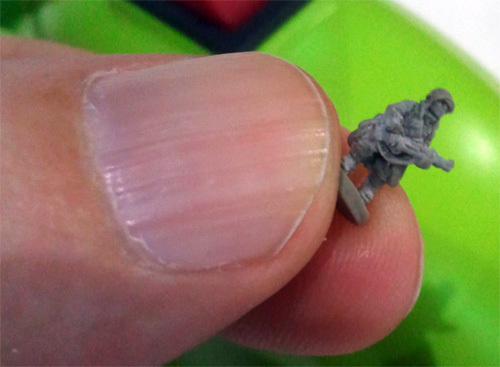 My left thumb and a WWII US marine by Seven Samurai sculpting team. 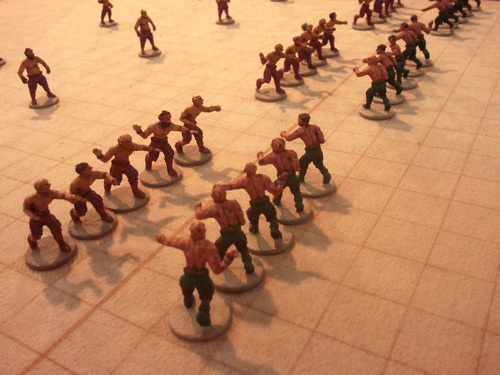 1-48 Combat is back as 1-48 Tactic. 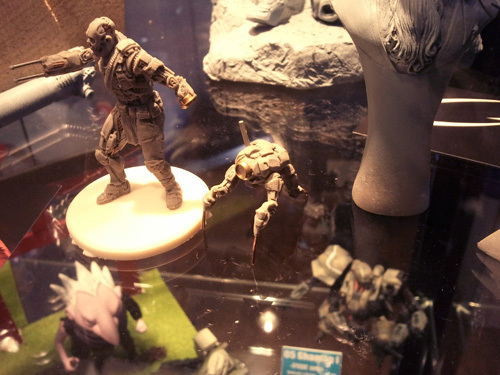 This is a miniature for the game with his twin in a smaller scale. We were a very large team in that mess. Some faces were the same of the previous years, some are new. Every evening we took a dinner together in various restaurants, the only moment when we could chat. We are part of a community, we are wargame players. I’m late, very late. 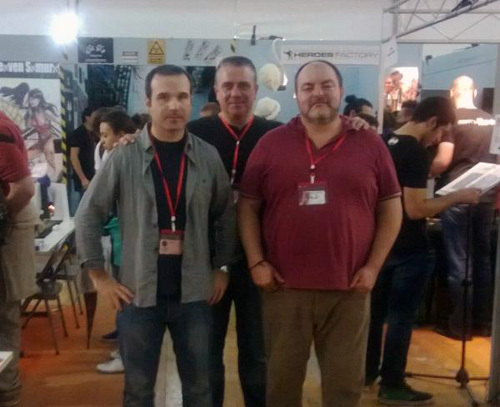 But I want to show you something about my past experiences in conventions held in November. 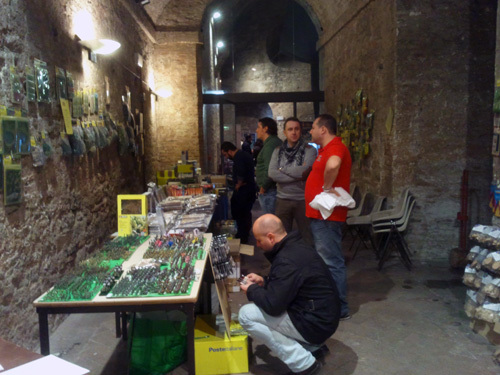 This time my report about GiocaPerugia 2013, the 16th and 17th of November. The Perugia mini underground, almost a monorail. We arrived early in the morning by car. After we take this great public transport that penetrate inside the hill under the city. 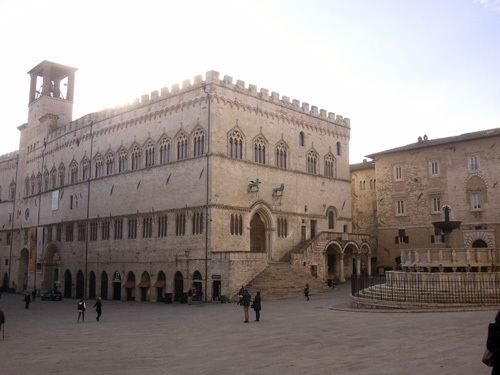 In a lazy early and frozen Sunday afternoon, the main plaza in the city. 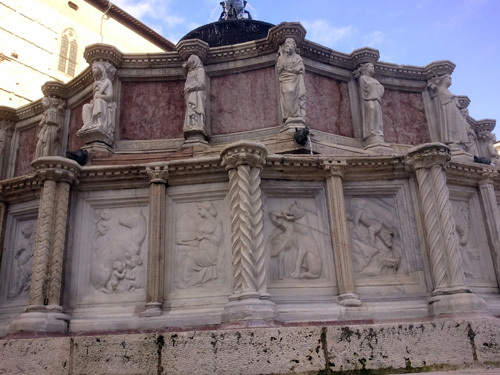 The main fountain of Perugia, that is in the main plaza of Perugia. I took these photos during a pause. 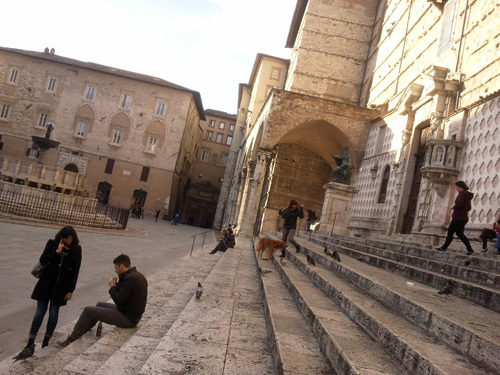 I thought:”Now they are two days in Perugia and I didn’t see the city centre!”. Well, I didn’t see the light of the day. Because the convention was held underground! 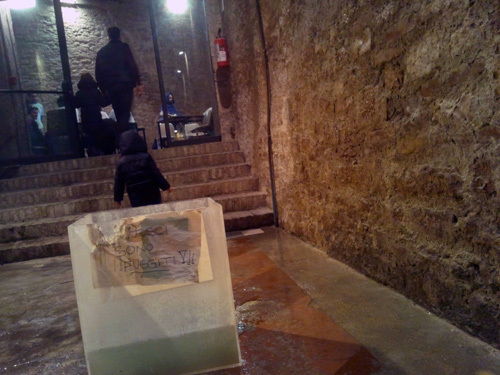 We were inside a real dungeon, a place 500 years old under a fortress. 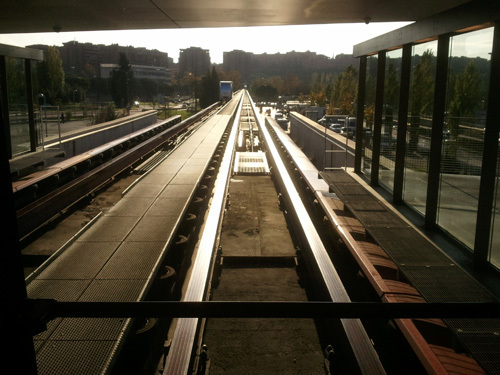 It is even used as a way with escalators to reach the upper part of the city. An ancient dungeon mixed with modern public facilities. 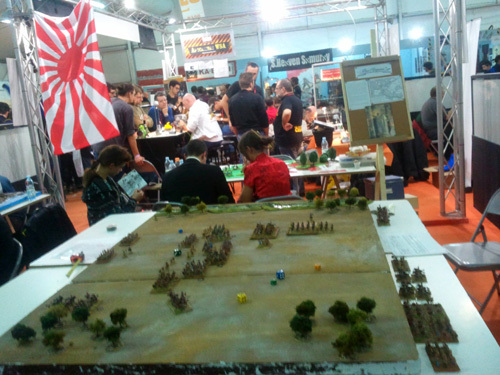 Aster Wargame from Rome. All for your miniatures. Always in the vendor area. 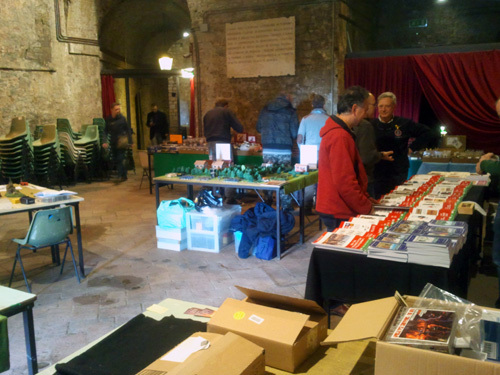 On the right Chillemi, editions about military history. 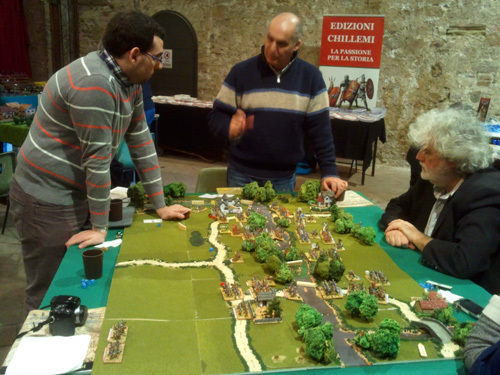 The professor Gualtiero Grassucci from Latina with his wargame. 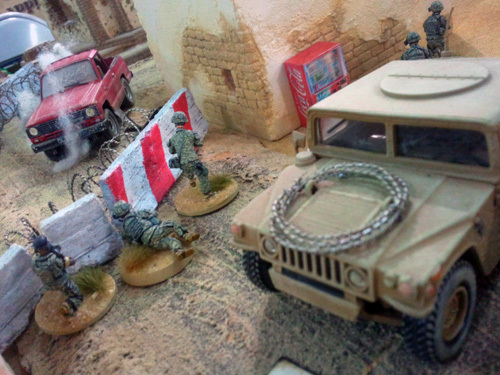 A wargame in a box with a gangster feel: Men of Honor! A room with some boardgames. And a couple with a boardgame. Another room full of boardgames for casual gamers. 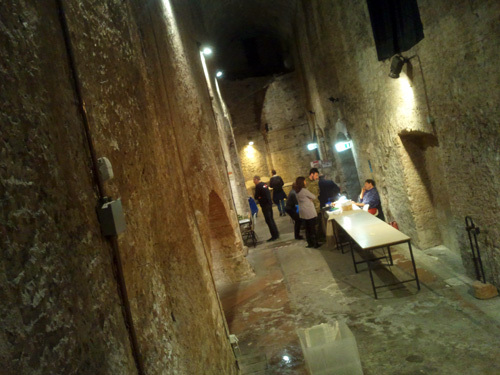 And another room inside this dungeon, with some convention volunteers. More tomorrow on another post. 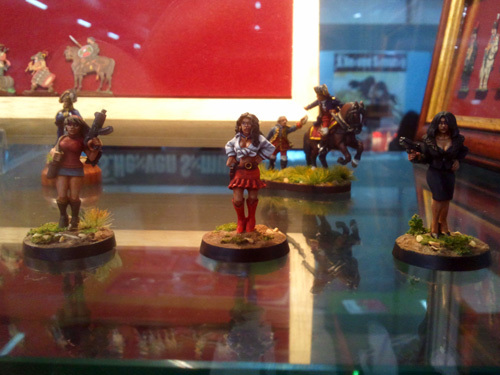 More miniatures in Lucca Games pavilion. 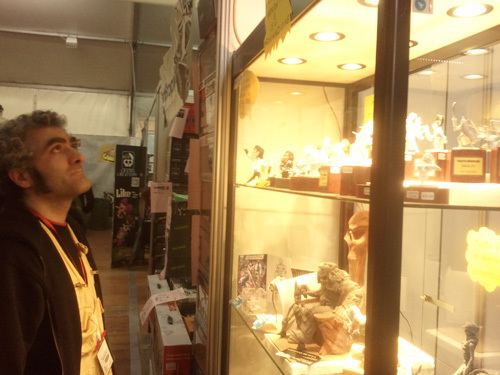 Here my mate Narciso that is dazed watching some greens by a miniatures sculptors stand. He wish to produce some miniatures too. If you remember, Narciso is the man that last year sculpted my pagodas for Zen Garden. 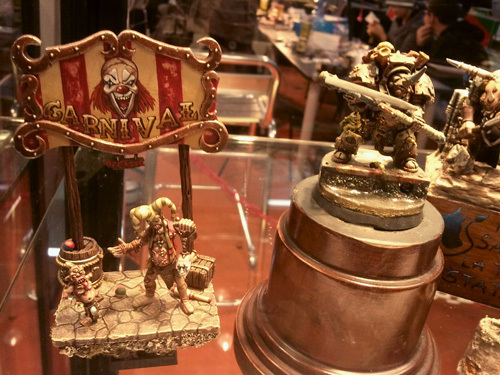 Same stand, part of the display case. I fell in love with that sort of cyber-spider. Only a green for now. An absolute preview! The first pieces of a new range by Cosimo Auricchio. 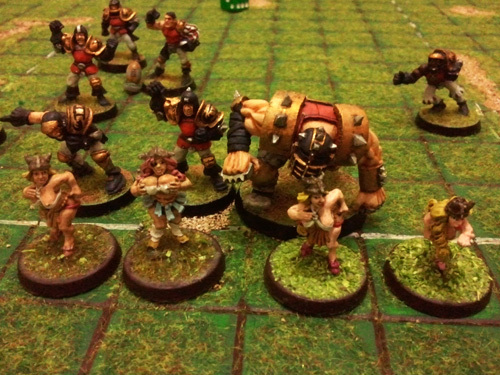 They are dwarf gladiators for Blood Bowl. 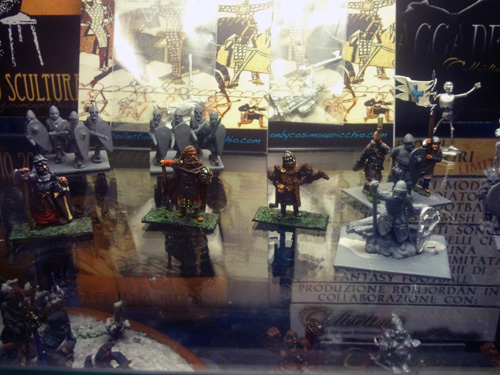 I have instantly reserved a set for me… On the background the new legionaries range. 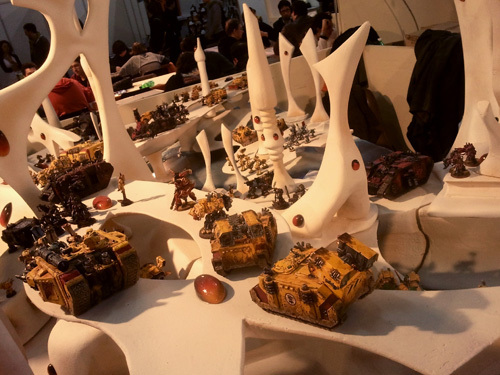 A waste of sci-fi tanks at unreal little distance each other: a huge WH40k scenario. The Calcio Storico Fiorentino (Florence historical football) is an ancestor of modern football and rugby, and it is still played nowadays. It is a very strong violent kind of football. Some years ago the authorities prohibited the annual match because it was the opportunity to settle a score among criminals and hotheads. Just like the Slapshot flick, the players forget the ball and start a brawl! People from Firenze are very proud of their traditions. 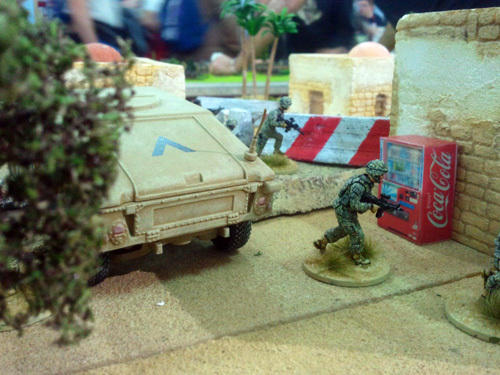 This is the miniature game by Castle Arts. 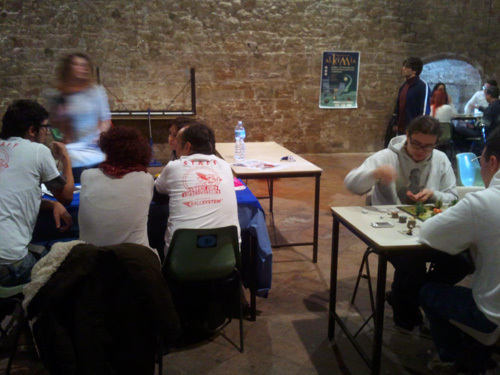 Alt si gioca was a wargame convention in Terni who took place the 7th of October. When I was free from my demonstrations I realised with my mobile a movie to report the event. To view a better show of the Napoleonics array, here another video. Once again it was the time of my birthday! Now they are forty-three. My mate Diego had his birthday the day before, so I tried to create a birthday event with miniatures for both of us together with our friends. 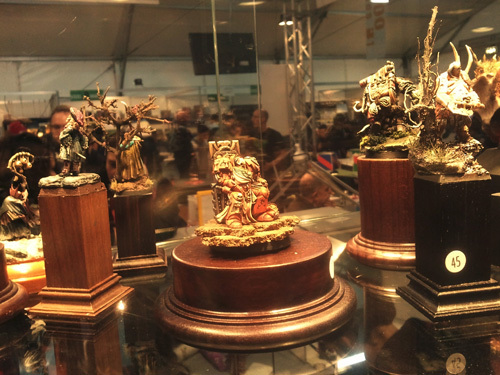 The choice for the location was Terni, our adoptive city as regard to the miniatures. This is the picture of the participants. You may notice that Andrea Ganesha is sponsoring a vintage box of D&D miniatures that he found at Sergio’s home. A little pirate instead taught us Blood Bowl secrets. A big surprise for us was a prototype test for a new rule engine by Sergio, the man behind the revolutionary Large Battle Drums and Shakos. It was only the basic engine without historical and terrain features, and it just worked very well! 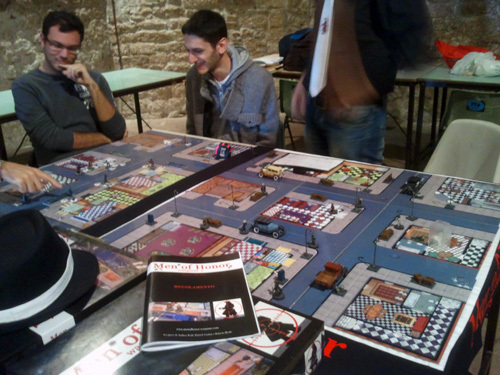 It is a game based on area movement and presence, driven by cards and a fighting style adapted from the LBDS dices. It can be develop for various periods. It is very great! An entire family of rulesets can be generate from this engine. 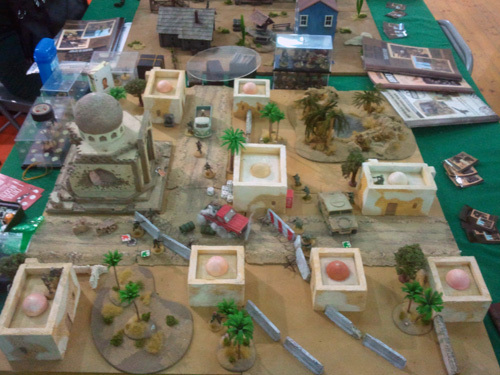 The only problem is that wargamers are not fit with the concept of areas, they think that this is not for wargames but boardgames. 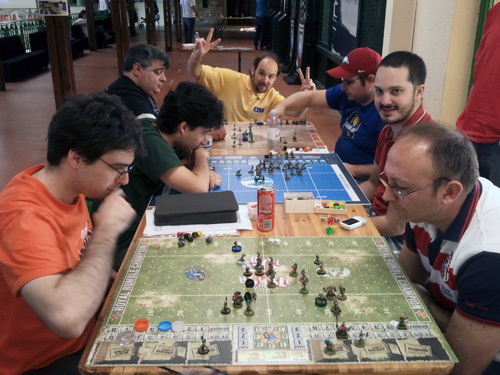 The latter half of the day was with Blood Bowl, a game that I tried a lot of years ago when the first edition was out in the eighties. At that time we haven’t got the miniatures but die cut cards on plastic bases and Games Workshop was only a creative company from Nottingham. My friend bought the expansion too. 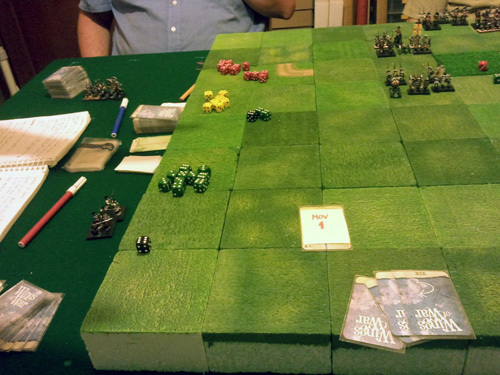 We didn’t understand the rules very well, we hadn’t experience with games, I don’t didn’t speak English, so we put the two boxes in an angle and forgot that fantasy football field. Now after ten years with DBA we want to find something new (!!!) and we are interested in Blood Bowl. I made my first game after 25 years and I liked it. The beautiful football stadium is made by Sergio and will be present at the next convention in Terni “ALT si gioca” in October, when a BB tournament will be held. 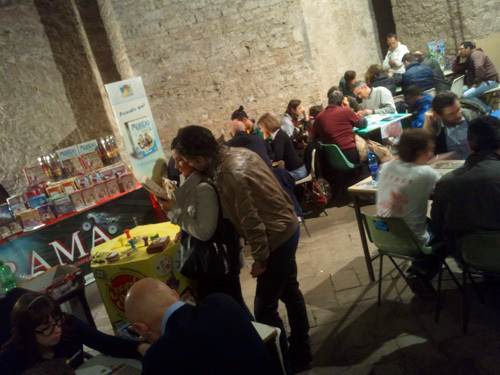 In Italy there are a lot of boardgames (at most) conventions with the suffix Gioca- (play) and then the name of the city. 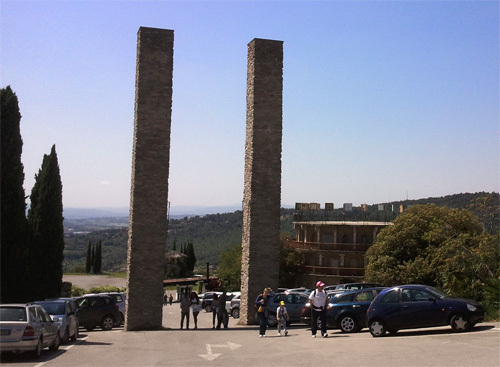 So we have even this GiocaPerugia on the hill next Perugia and site of Città della Domenica. I spoke some months ago about Magna Con Phersu and this amusement park on this and this post. 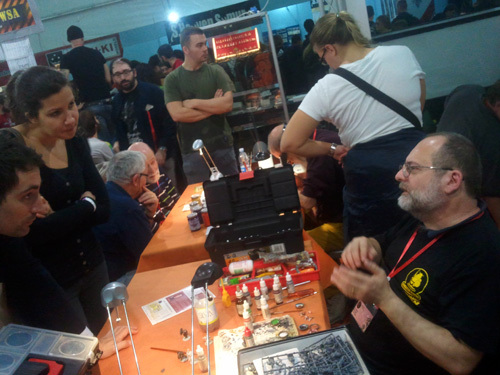 Now this GiocaPerugia was a bigger convention and this is the dedicated website. The other time we were in Winter so the park was close. This new trip to it was a chance to visit it. The place is really huge, a paradise for children but something else for other people. 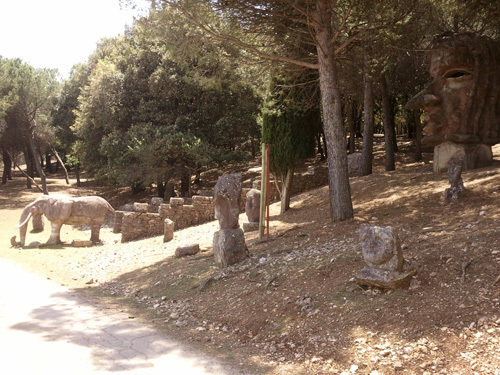 It is a park for families built too much years ago, so it shows his age, as these decorations designed as beautiful statues that must recall various places in the world. Ugliness in the middle of typically Mediterranean late spring vegetation. A matter of style aged too soon. Among other things you can find a mock castle, a mock missile, a mock Indian encampment and blue shirts fort, some buffaloes, some exotic goats, some horses and a cow. You understand, it is not so beautiful, but in some ways educational and with the morbid fascination of vintage amusement parks. Well, inside a pavilion there was enough space for GiocaPerugia too. 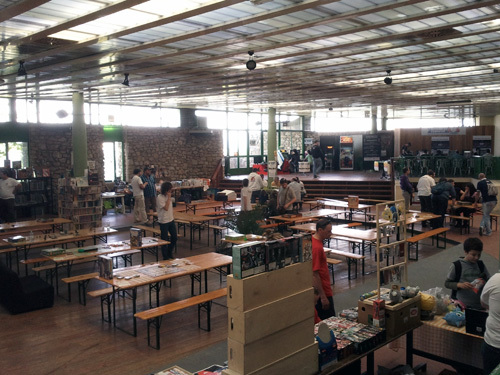 We had a large room and some space outside, a lot of available tables, some vendors, some games ready to play, but we hadn’t an essential element: there were not enough people. 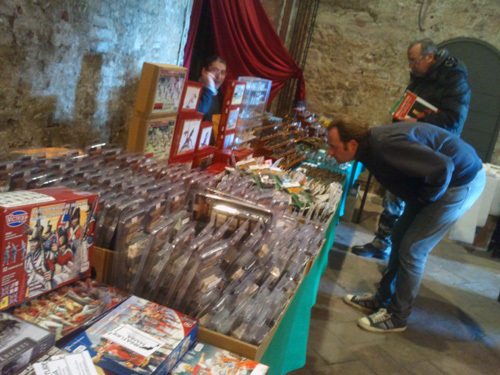 Perugia is a city full of young people, there is an international university that attracts them, so it was desirable a large participation because part of them surely know boardgames, cosplay, wargames and what is related to them. So, what’s the matter? I don’t know, maybe lack of advertisement? I don’t have the answer. Inside GiocaPerugia a Blood Bowl tournament was organised, and some friends of mine was fighting on the green grounds with chainsaws and dirty hits. 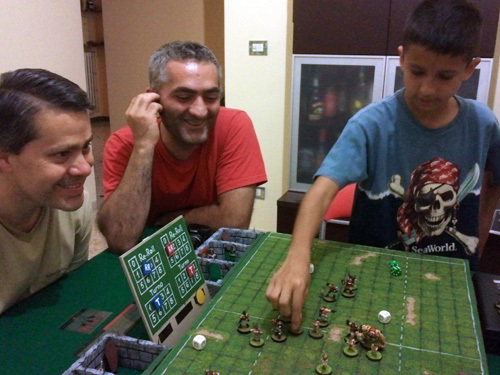 Blood Bowl is the new sensation (!) among people who plays DBA (more !!!). I tried the game when the first edition was hot off the press but maybe at that time something was a little confusing and we didn’t play it so much. Instead nowadays I’m thinking to compose a couple of teams. I like the idea of making an unique team using a few miniatures with a specific theme. I’m collecting gorgeous babes pieces to create an Amazon team, and I’m thinking to some snowmen for a more frozen set. 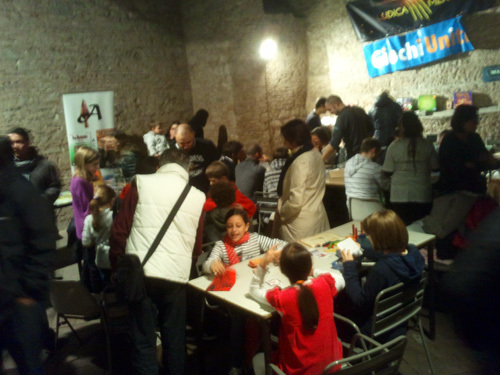 I met some people from Rome and maybe (thanks to me) in Ludica in November we will have a tournament with 50 people.